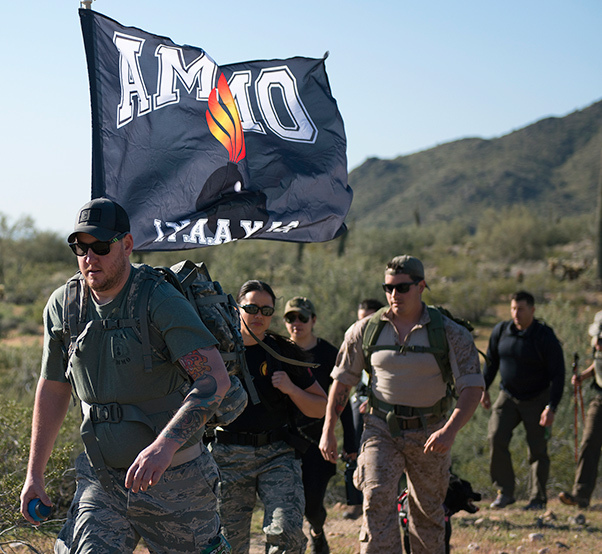 Participants in the March of the Fallen ruck march climb a hill in Buckeye, Ariz., March 16, 2019. Attendees rucked 4.5 miles to honor fallen troops and to give back to the community, by filling their bags with canned foods that were donated to a local food bank. 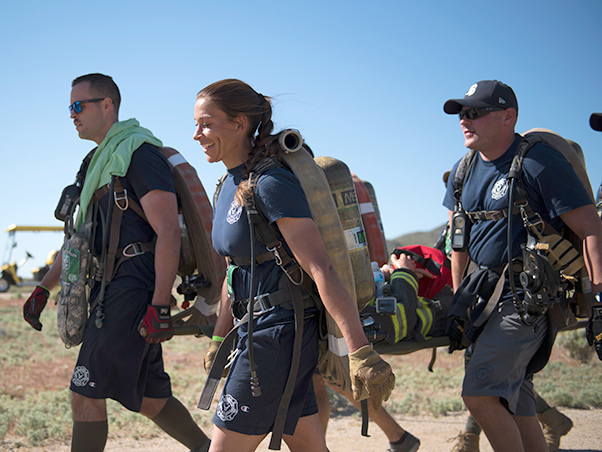 Firefighters from the 56th Civil Engineer Squadron were one of a few teams to participate in a six-person litter team competition as part of the March of the Fallen memorial event in Buckeye, Ariz., March 16, 2019. The team carried 150 pounds collectively while each member carried a ruck with 45 pounds worth of canned goods a total of 4.5 miles. More than 100 individuals marched in the event and at the end of the ruck the canned goods were donated to a local food bank. 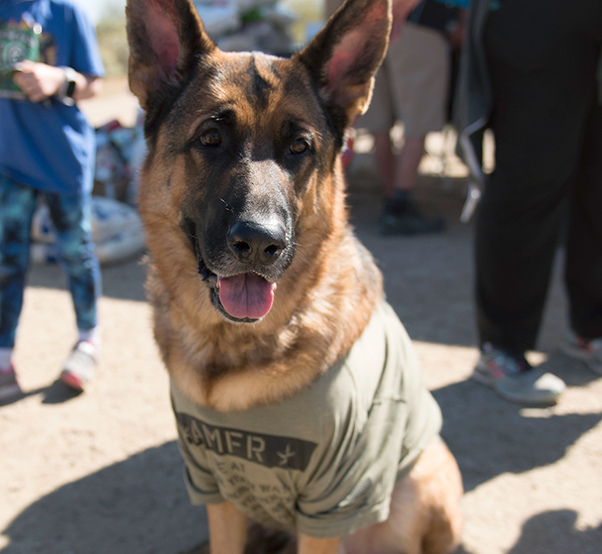 A dog sits at the March of the Fallen ruck march while wearing an event t-shirt in Buckeye, Ariz., March 16, 2019. Individual ruckers and litter teams with bags full of canned goods to be donated to local food banks gathered for the 4.5 mile ruck dedicated to honoring fallen troops who gave their life during war efforts. 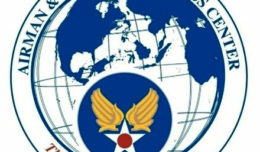 A tribute for Staff Sgt. 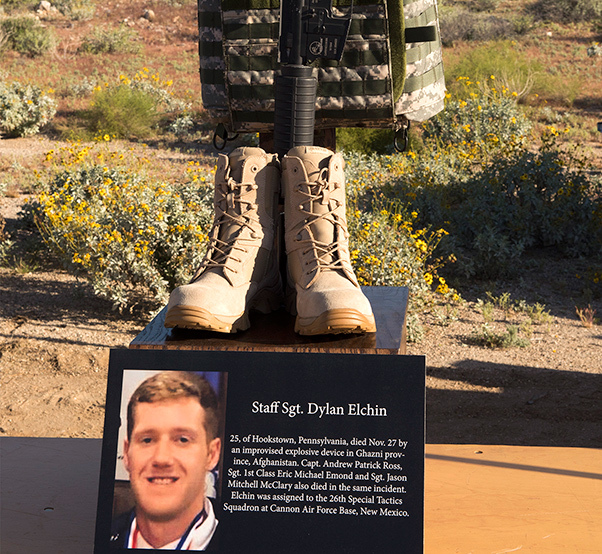 Dylan Elchin, 26th Special Tactics Squadron combat controller at Cannon Air Force Base, N.M., sits on display at the March of the Fallen ruck march in Buckeye, Ariz., March 16, 2019. 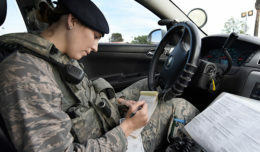 The event is held to honor fallen troops like Elchin, who was killed Nov. 27, 2018, when his vehicle hit an improvised explosive device in Ghanzi Province, Afghanistan.